One of the largest churches in the world is nearing completion – over 120 years since it was begun. 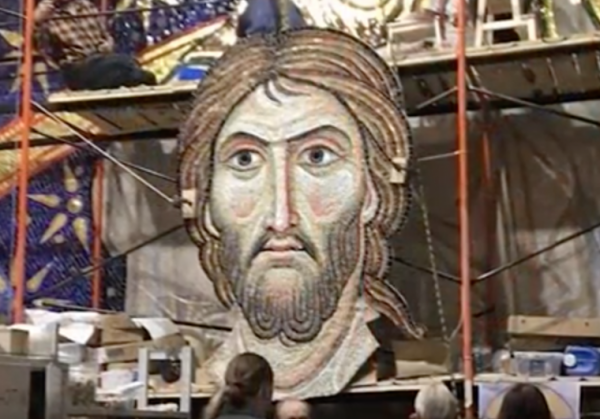 The latest addition to St Sava’s Orthodox Cathedral is a massive mosaic of Jesus – thought to be the biggest ever. The building, in Belgrade, the capital of Serbia, was begun in 1894 but work was interrupted by various wars and delays. The shell was completed in 1989 but interior work continues. Now, the mosaic, which cost around four million dollars and weighs 11 tons has been delivered. It has been designed and paid for by Russians. The Russian and Serbian Orthodox churches have been historically close. The aim is to complete the building entirely in time for 2019, which will see the 800th anniversary of the Serbian church being granted autocephaly – the ability to govern itself alongside the other eastern Orthodox churches. The Cathedral is the seat of the Archbishop and Patriarch of the Serbian Orthodox Church. The Church itself has a reputation for being integral to Serbian identity, similar to that of the Russian Orthodox church. Pro-Russian feeling runs strong in Serbia and the political role of the Orthodox church has long been observed and debated. You can see a video of the mosaic below.